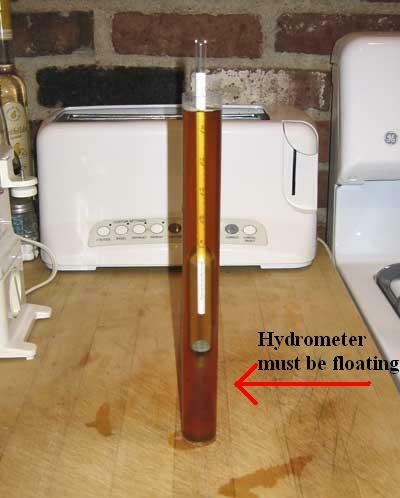 Using a hydrometer, measure the Specific Gravity (S.G.) of the wort before adding the yeast. This initial reading will be above 1.000. Water has an S.G. of 1.000, but since we've added malt and other adjuncts, the S.G. is naturally higher. Once you have your starting measurement, allow the yeast to do its magic. This converts sugars into alcohol. Since alcohol has a lower S.G. than water, the readings from the hydrometer will go down. Warm honey runs easier than cold honey. 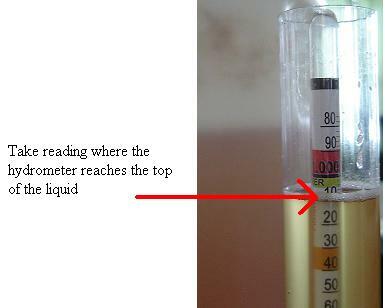 If your wort is warm, the hydrometer falls further into it, giving you a lower reading than if you wort was cold. Let's say our initial reading (Original Gravity) was 1.058 and our last reading (Final Gravity) was 1.009.